"Gretchen Jones is amazing! She has been very caring and cautious throughout my pregnancy"
"Gretchen was AWESOME! She was VERY patient, reassuring & calming with my daughter"
Gretchen Jones, WHNP-BC, CNM serves as a women’s health nurse practitioner where she provides comprehensive obstetric and gynecologic care to women of all ages. 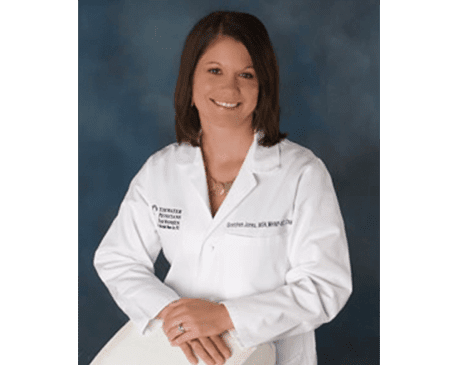 She has a passion for helping adolescents with their first experience with reproductive health, health concerns, and preventative care for their body. Gretchen also has a passion for helping women who are struggling with postpartum depression. Gretchen began her training at Louise Obici School of Nursing in Suffolk, Virginia, where she graduated with her RN degree. She continued on to earn her BSN from Virginia Commonwealth University. She earned her MSN from the University of Cincinnati as a Women’s Health Nurse Practitioner and Certified Nurse Midwife, subsequently receiving NCC certification. Gretchen is married to an active duty serviceman in the Virginia Army National Guard and is the mother of two young children. She loves nothing more than spending time with her family, and when she has a free moment, she loves to read and enjoy photography.